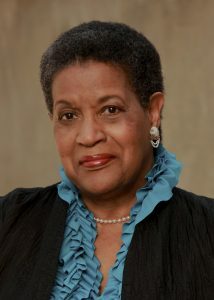 “Any serious discussion of the civil rights movement’s future must deal with at least four moral and organizational imperatives—stewardship, inclusiveness, concern for the disadvantaged, and re-dedication to non-violence as both ethical and effective tools for struggle.” It was with these words that Myrlie Evers began her legendary tenure as chairman of the NAACP after defeating the incumbent by one vote. The NAACP was in disrepair and plagued with financial difficulties, scandal, and controversy. Evers’ positive reputation among civil rights activists made her election a cause for renewed optimism among NAACP supporters. Through her unwavering vision and determined spirit, she is credited with spearheading the operations that restored the NAACP to its original status as the premier civil rights organization in America. She became the first chairman-emeritus in 1998, when she retired to establish the Medgar Evers Institute which is now the Medgar & Myrlie Evers Institute. Myrlie Evers is perhaps best remembered as the widow of Medgar Evers, Mississippi’s first state field secretary for the NAACP, who in 1963, was gunned down in the driveway of their home in Jackson, Mississippi. She waged a painstaking battle to keep her husband’s memory and dreams alive, and valiantly lobbied to bring his killer to justice. In 1994, her diligence eventually paid off when the assassin was brought to trial for a third time and finally found guilty of the murder of Medgar Evers, more than 30 years after the crime. Always a voter rights activist, Evers became a candidate to represent the 24th Congressional District of California in 1970. She went on to become the first black woman to head the Southern California Democratic Women’s Division and was convener of the National Women’s Political Caucus. In 1988, she was the first black woman to be named to the five-member Board of Public Works by Los Angeles mayor Tom Bradley, where she helped oversee a budget of nearly $1 billion. In addition to public service Myrlie Evers began her corporate career in 1973, with the New York firm, Selligman and Latz, Inc. where she held the position of vice president for advertising and publicity. For 10 years Evers worked for Atlantic Richfield Company (ARCO), as the national director for community affairs, and later as director of consumer affairs. During her tenure at ARCO she developed the concept for the first corporate booklet on women in non-traditional jobs, Women at ARCO. As an author, Myrlie Evers has captured the work and historical significance of the civil rights movement through several publications chronicling the life of Medgar Evers. In 1967, she co-wrote For Us, the Living, with William Peters; and in 2006, with co-author Manning Marable, she penned The Autobiography of Medgar Evers: A Hero’s Life and Legacy Revealed Through His Writings, Letters and Speeches. In 1999, she published her personal memoirs, Watch Me Fly: What I Learned on the Way to Becoming the Woman I Was Meant to Be, which charts her journey from being the wife of an activist to becoming a community leader in her own right. In addition to holding 16 honorary degrees from leading colleges and universities, Evers is a recipient of numerous civil rights, human rights, and community awards. Her governance expertise has been recognized by national and international organizations. In 2007, as NAACP chairman-emeritus, she led a delegation to Paris France to present the Conseil Representatifs des Associations Noires (CRAN) with a recognition award in support of its efforts to achieve racial equality and social justice for black Frenchmen and women. She has been the featured keynote speaker for renowned organizations such as the Milken Institute and TEDx. Augmenting her social justice advocacy work, she remains an often sought after lecturer at colleges and universities. Today, Evers continues to be a trailblazer in every field. Balancing her passion for justice and equality with her love and training for music, her talent was highlighted in a special concert series at Carnegie Hall in December 2012. Selected by President Barack Obama, Myrlie Evers became the first layperson and first woman to deliver the inaugural invocation at a Presidential Inauguration. She has returned to Alcorn State University, where she and Medgar Evers met, as distinguished scholar-in-residence on the Lorman, Mississippi, campus.